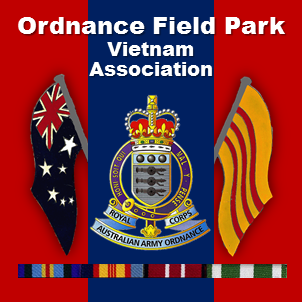 2016 – Albury NSW (50th Anniversary – Ordnance Field Park Vietnam Assn. The morning of Saturday 23 April 2016 Bob Nash and Tony Flanagan got together in the Dawson Room at the Atura Hotel and started making up the Reunion gift bags for the Meet and Greet that night. In the afternoon Bob and Tony then sorted out the layout of the room with Atura staff and Bob did a slide show test. The evening started at 6.00pm with attendees collecting their name tags and bags of goodies consisting a unit tie, cap, stubby cooler, mug (two if you came as a couple – one if you were single) a new book about the OFP, a set of four coasters, Corps Badge and book mark. At 6.25pm our first official guest arrived, the Mayor of Albury NSW Cr Henk van de Ven with his wife Sue an ex-ten year member of the RAAOC. Sussan was hosted by Garry Downs and the Mayor by Peter MacFarlane. After they had settled in with a drink in hand Bob proceeded with the launch of our new 50th Anniversary Commemorative Book-“Ordnance Field Park-Vietnam and Beyond”. They both stayed for well over the expected time that dignitaries normally stay at these type of functions and they both enjoyed the slide show prepared by Bob dedicated to the men of Det 1 OFP Nui Dat May 66 to May 67. Both dignitaries were presented with a goodies bag before they left. Sunday saw us all depart the hotel for a day tour of Historic Towns of Beechworth, Myrtleford and Bright in the North Eastern Alpine Region of Victoria. Lunch was had and enjoyed at the Club Savoy Myrtleford. On our return the Caravanners went on their way back home in Wodonga and everyone else dispersed to various watering holes in Albury. Many ended up at the Commercial Club which was directly opposite The Atura, our Reunion HQ. Monday morning a few ventured up Monument Hill for the 5.30am Albury ANZAC Day Dawn Service. Normally only one wreath is laid by the President of the Albury RSL but on this occasion, because we were also marching in Albury and Wodonga, permission was granted for Bob and Tony to lay a wreath on behalf of our Unit Association. The Parades over, back on the bus to Albury and this time to the Waratah Room at the Commercial Club. With drinks flowing we all had a wonderful meal. Tony read a list of departed mates since our Darwin Reunion and Doug Blatch toasted Absent Friends. The late John Koch had left $1000.00 in his will for us to have a drink on him. Bob read John’s memories of Vietnam (from our book) and his good mate Col Burrows said a few kind words and we toasted KOCHIE. Garry Downs toasted the Corps and the Queen our Colonel in Chief. Bob produced another slide show taking in all of the OFP from 1966-72. The crowd drank on and to our amazement didn’t drink the $3000.00 allocated for the afternoon for drinks. Tony got a resounding NO vote on whether the OFP should amalgamate with the RAAOC Vietnam Reunion in future. This now puts the argument to bed for good. It was noted by all that our little overseas mate (USofA) Greg Quinlan accidently wandered into the ladies (signage a little different on the other side of the world) and came out with flowers. Unfortunately he was sitting with Ian Tasker and Harry Couper and boy did they take the piss out of him. Tuesday saw us board the buses for our trip to Seymour and the VIETNAM VETERANS COMMEMORATIVE WALK where all those including entertainers have their name inscribed on the Wall. Our Unit pavers dedicated to the members of the OFP VIETNAM looked absolutely brilliant. It was interesting to see who has a personal paver there as well. Graeme Clough and his with Carol, together with Darryl Bennallack, drove over from the Bendigo region to catch-up with us at the Walk. They joined us at the Seymour Club where we had a very enjoyable lunch. Back onto the buses for our trip home and a small stopover in the famous town of Glenrowan where Ned Kelly made his famous last stand. Wednesday, on the buses again for a quick tour of the local area including the old migrant camp at Bonegilla, next to the old RAAOC R and T Wing where most of us did our Corps Training for ten weeks, and a stop at the famous Ettamogah Pub. By 6.30pm most were settled in at the Auditorium at the COMMERCIAL CLUB. This was the first time we had ever had spirits as a part of our drink package and still we didn’t reach our limit. The main meal was a choice of four dishes and dessert a choice of three dishes. Before the band “OVERTIME DUO” commenced Tony and Bob had a few announcements to make. Tony greeted everyone both old and new, and guests, also reading out a list of apologies of those who couldn’t make it. Tony toasted the ladies. Following this Bob read out letters we received from Her Majesty The Queen and the Prime Minister on the occasion of our 50th Anniversary of our deployment to Vietnam. This Reunion we had the pleasure of the late Des Surtees brother Ray and his wife Barbara. Other guests included longtime friends of Tony, who helped in settle on his return from Vietnam, Clark and Lyn Alexander. The six original members of Det 1 OFP, who were able to attended the reunion, were presented with certificates to honour their work in setting up the OFP area in 1966. A raffle between the Det 1 OFP guys for a jacket procured by Les Wilkinson was won by Peter MacFarlane. Bob thanked Les Wilkinson and his Seven Hills RSL for the contribution they made in assisting us to obtain a DVA Grant for the reunion. Tony was presented with a beautiful Plaque (see at end of report) for his seventeen years in organizing our ten magnificent Reunions all over Australia. Again we were amazed that we had six new attendees for this Reunion and we are hoping we will see them again in Brisbane in 2018. The band played beautiful music not too loud and George and Rhonda Foster gave us a display of their dancing skills along with many others. The Dinner came to an end approx. 12.00 midnight after everyone had said their goodbyes and headed off home to where ever they were staying. A special mention to Mick Sporn for taking on the role of Function Photographer – Thanks Mick!! Thursday saw most depart back to their home states. A few stragglers left on Friday all looking forward to 2018 where the emphasis will be the closing down of Det 6 OFP and the raising of 1 OFP. We already have a spot in the Brisbane ANZAC Day Parade thanks to the OFP guys in Brisbane.